176 Brigade was assigned the task of establishing the bridgehead. A suitable fording place for infantry was found opposite Grimbosq. The brigade forded the Orne on the night of August 6/7 and occupied Grimbosq and le Bas while the bridge was constructed near the latter. By 0720 on August 7 the bridge was completed. 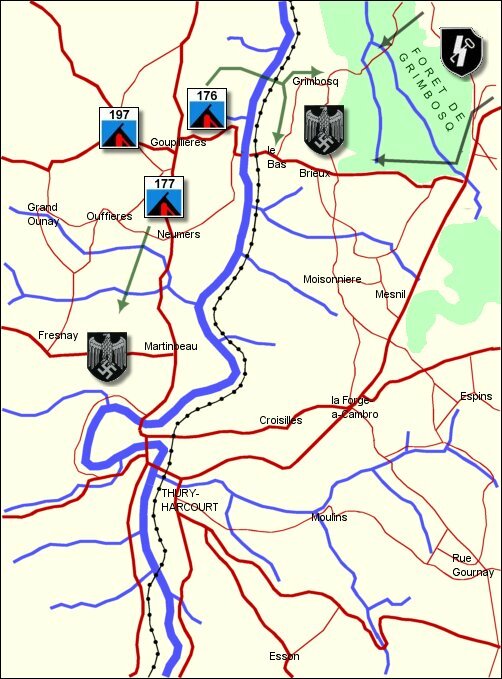 177 Brigade was ordered to secure the right flank of the division, and pressed south toward Thury-Harcourt on August 6. They encountered strong defensive positions on the Fresnay-Martinbeau ridge. Artillery support was minimal due to the demands at the bridgehead, so the advance stalled. 197 Brigade formed the reserve at Goupillières. 107 and 147 Regiments, 34 Tank Brigade provided armour support. 271st Volksgrenadier Division (Wehrmacht) deployed from Grimbosq to north of Thury-Harcourt. The KG was named for its commander, SS-Ostubaf. Max Wünsche. Artillery fire began to fall in the Grimbosq and Thury-Harcourt sectors [of the German defenses] at 1840 hours on the 6th of August and during the night the infantry battalions of Brigadier Fryer's 176th Infantry Brigade, with support from two squadrons of the 107th Regiment RAC, established a bridgehead 1000m deep on the steep east bank of the Orne to the south of Grimbosq. By 0800 hours on the 7th a bridge had been constructed at le Bas (today called Grimbosq Halte), just to the west of Brieux. 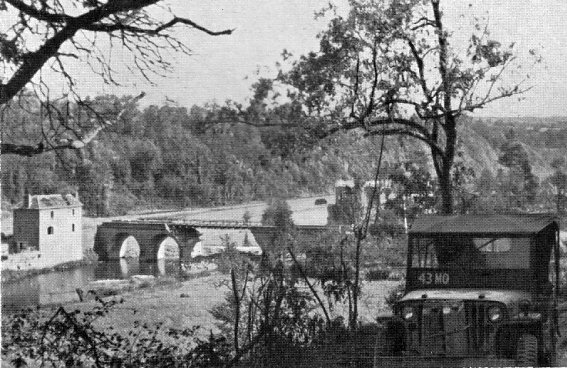 The bridge near Le Bas - view from the west bank of the Orne. Two counter-attacks by the 271st Infantry Division failed to dislodge the British and during the day the 6th North and 7th South Staffordshire and 7th Royal Norfolk Battalions enlarged their bridgehead to a width of about 3km and depth of 1500m. It was clearly time for Dietrich [commander of I SS Panzer Corps] to deploy part of his armoured reserve, and he ordered Wünsche to restore the situation. the slender bridgehead survived [by virtue of massive artillery support from the west bank of the Orne]. During the night another infantry battalion, 1/7 Royal Warwicks [197 Brigade] reinforced the depleted British force and Wünsche's tanks were forced to pull back from the river. Wünsche had prevented the expansion of the bridgehead but despite further attacks he could not destroy it. In view of the major crisis developing to the south-east of Caen [Operation TOTALIZE - the Canadian breakout from Caen] he was ordered to break off his action. The British had stubbornly and successfully defended their bridgehead  it cost the 6th North Staffordshire Battalion 76 casualties and Lieutenant Colonel Ian Freeland's 7th Norfolks 42 killed, 111 wounded, and 73 missing. Captain David Jamieson of the 7th Norfolks was awarded the Victoria Cross for his part in this fighting. In the early hours of 9th August 197 Brigade launched an attack with 1/7 Royal Warwickshire and 2/5 Lancashire Fusiliers, to enlarge the bridgehead south-eastwards. This was literally uphill fighting and the enemy was still numerous, though somewhat disorganised. By the end of the day, however, the brigade had reached all its objectives and was up to the line La Moissonière—Le Mesnil. 56 Brigade crossed to the east bank of the Orne and prepared to advance southwards towards Thury-Harcourt. 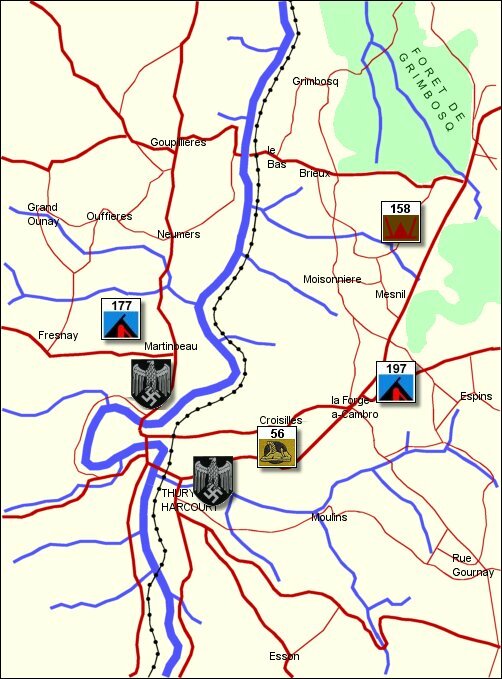 158 Brigade came under our command, and 177 Brigade was put under command of 53 Division to free our division to concentrate on an east bank attack on Thury-Harcourt. On 10 August 56 Brigade reached the last intervening ridge, capturing 200 very exhausted prisoners, but a patrol of 2 Gloucestershire, entering Thury-Harcourt at midnight, found it still strongly held. The brigade made repeated efforts throughout August 11 to occupy the town, without success. On the other bank 177 Brigade had fought their way down close to the river, but were unable to cross. 197 Brigade spent this time in enlarging the bridgehead towards Forge-a-Cambro and Espins. On 12 August the enemy was still resisting strongly in Thury-Harcourt, and an attack by 2 Gloucestershire during the afternoon failed, with heavy casualties in two companies. Enemy resistance on all brigade fronts was noticeably stiffer. On 13 August we could still make no headway into the town, though 5 South Staffordshire reached the river some two miles to the south of it and 2/5 Lancashire Fusiliers entered Grand Donnay, four miles to the south-east. The defenders of Thury-Harcourt were clearly in danger of being cut off, so we were not surprised when, on the morning of 14 August, a dawn patrol of 2 Gloucestershire reported that it could find no enemy in the town, which was promptly occupied.